But isn't it loud? Or was that mostly with the older gen AIOs from the pump? It will get easier in about 18 years...! Congratulations on becoming a dad! Yes, it is that much better due to 240mm of surface area to dissipate heat, and liquid transfers heat much better than air. If you would like to test for yourself then I think that is great. The more data we have the better. I will even show you step by step how I conducted the tests to ensure accuracy and reliability of each run - that way you can verify for yourself. The pump was not very loud. I found the noise tolerable. I even considered going out and buying an AIO due to the results. The data shows that the GPU is cooler overall with an AIO. Not sure how that works. Think it's important to note that is with slim fans as well . Would the regular thickness fans have for? I dont think you understand how cooling works. Watercooling does not cool any better. Because in the end the heat needs to be disapated into the air. So the only way watercooling is better is because it has a better cooling surface - read “bigger” or “more effecient” surface. 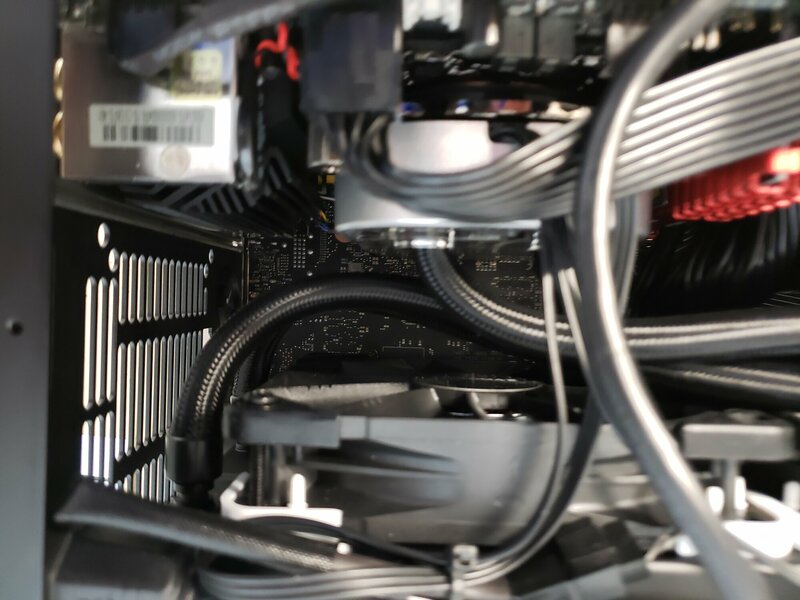 The only real advantage to watercooling is the ability to reroute the heat to a better placement where you have more room to fit a bigger radiator. 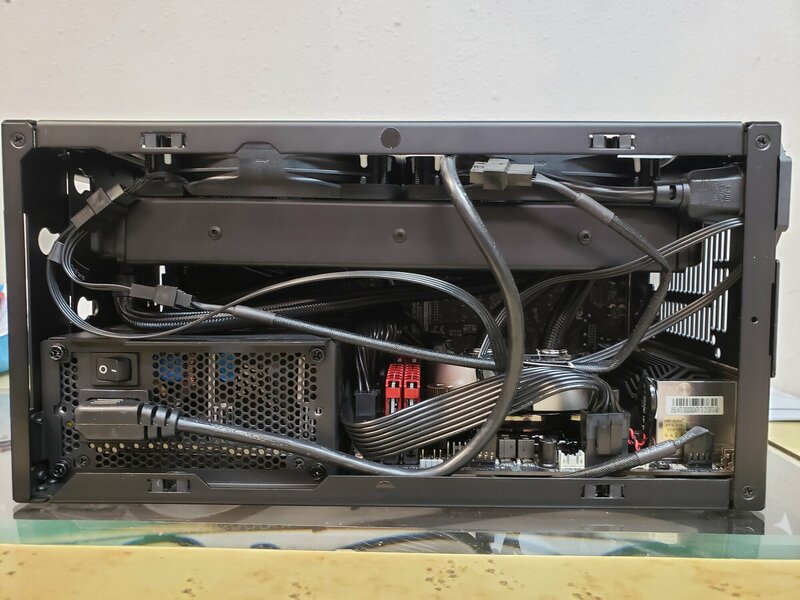 The only reason a big 360 rad cools as goods as it does is it sheer size.. an air cooler that size would be hard to fit because of other components and compability with cases. I dont think the surface is not much bigger.. but i really dont understand the GPU is not cooler when the air coming from the CPU is that much cooler. One thing I think you might be overlooking is mass. Water is a pretty big heatsink just by its self. 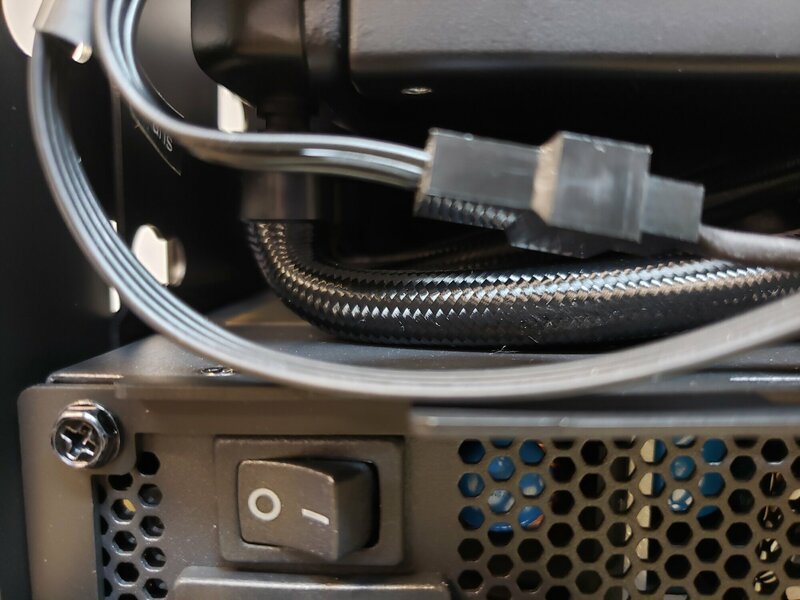 You do need to eventually exhaust the heat, but if you can store a large amount of heat away from the CPU you don’t need to exhaust it as fast. I haven’t accounted for fin density, but based on the exterior dimensions of the C14S and a 240 AIO the C14S actually has more radiator surface. So something else is going on if the AIO is cooler. I think water’s ability to hold heat is the cause. Looking forward to what you find out when you test them. I think the AIO was tested with the A12x25 which is a regular 25mm thick fan. I think you misunderstood me.. I'm not calling you stupid or a lier.. I am sorry if you fealt that way! I just think there is something wrong the test result. This is the first time I am seeing an AIO beating Big Air in the Ncase. Is it a thicker rad then other 240 AIOs? Just to be completely honest. Your tests are golden data! I apriciate it more then my words discribe! forward to what you find out when you test them. Sure the water absorbs a lot of the heat, but given time it should all be heated up. I would expect M1AF has accounted for this..
Those 14c difference is a lot.. enough to OC my 9900K to 5GHz without fearing meltdown! That's correct. I knew people wouldn't be happy unless those fans were used so I bought another one just for the tests. I actually haven't looked into other people's testing. Do you have a link to past big air vs AIO's? I'd love to take a look at their data. I made sure the water temperature was at 30C before I began each test. ... I made sure the water temperature was at 30C before I began each test. No, what I meant was that watercooling takes longer to heat up and such a WC test should always be longer than a air test because you gave to factor in the fact that the water absorbs a lot of the heat..
An air cooler will reach it max temp after maybe 5min.. where as water will take 20min or more to fully heat up. Are there any better 240 AIOs (talking strictly rad+pump performace (not better or faster fans))? Or is the EVGA 240 CLC the best (its from 2017)? My original tests were for one hour. The water temperature never got above 40C, and the numbers were within 1-2C of my readings at 15 minutes, so I went with 15 minute tests that way I could run each test twice instead of just once. Again, the maximum temperature that the AIO's got were within 1-2C after one hour vs their 15 minute test. I scrapped all the 1 hour data so that way all of the tests would be for 15 minutes. I found that the air coolers were still increasing temperatures even after 15 minutes. The AIO's pretty much stay the same from 15 minutes through an hour. From what I understand the new h100i pro might be using the latest generation pump. I don't know if that would lead to better performance. Okay now I have to buy a H100i Pro just to see it with my own eyes..
What I am worried for is the noise from the pump. I like to run my fans on my 9900k build @0rpm or 20% for an inaudible experience. Well Ill have my CLC 240 back tomorrow. Ill report back. xSDMx and Boil like this. Just a quick heads up to NCASE M1 owners and potential owners. Today we built a system in an NCASE M1 V2.0. We used an ASUS ROG Strix Z390-I. This board has compatibility issues with the case due to the IO shield and VRM heatsink. The 92mm rear exhaust fan would not fit. 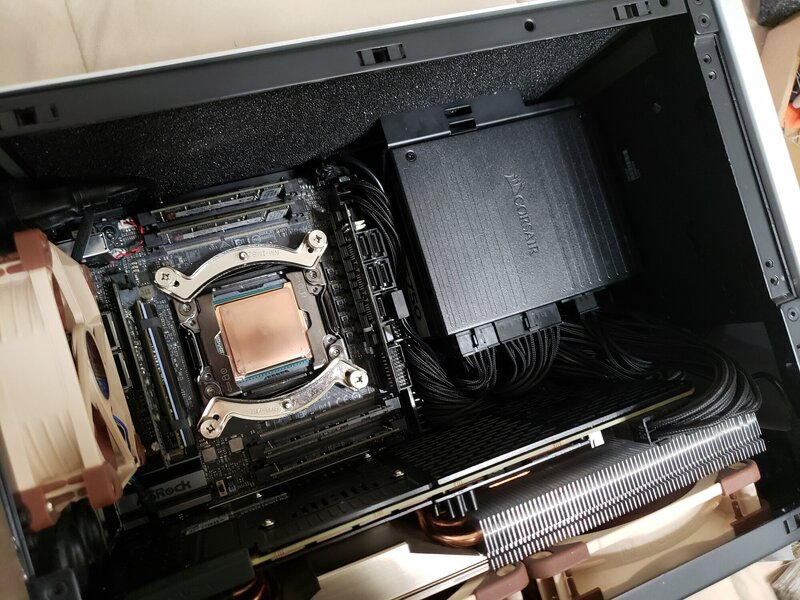 Additionally the board is not compatible with the MSI Ventus 6G OC RTX 2060 due to back plate clearance issues. Not sure about other versions of the case, but for the V2.0, get a GPU without a backplate if you're using the ROG Strix Z390-I mainboard. What all core overclock were you able to hit with the big air setup? Thanks for pointing it my typo. Wait, you can put an accelero3 on a 2080fe? My last understanding was that it was not possible due to new pc different from the pascal 10X0 serie. So you can also do Accelero 3 with 2080Ti? In that case I migh go this way more than evga 2080ti Ultra Gaming. Sorry?.. Right as I am writing this, all fans in my NCase is running 0 RPM in idle. GPU, PSU, CPU all. So mechanically noisefree. I take the hit on performance for aesthetics. I run with a tinted tempered glass window and I get to stare at my fat sinks all day. Sure in that case I get it. But then I would go with the C14S bare-look. Broke down and got the SF750. Dat cable management tho. Christyles, MIDIBoss, Qrash and 5 others like this. MUCH better than my job with my SF600! haha.. Looking good! Are those the stock cables...? If so, a bit more into how you cable wrangled them, please...!?! And what is that material you have at the top of the chassis...? Yeah they're stock cables. I just plug everything in the PSU and board then shove all the cables in the back making sure they don't hit the bottom fan. The top is a foam dust filter I cut to size and glued to one of my silver tops. I use it when I'm not running tests. Qrash, BaK2BaK and Boil like this. Just ordered the Corsair H100i Platinum.. Dont care for the RGB stuff, but was on sale, so the same price as the Pro model and the RGB fans are easier to sell to the 15 year olds - will add A12x25 PWMs. So will be cheaper in the end. And apparantly the Platinum coolers are made by CoolIT and not Asetek (gen 6).. Dont know if that is good or bad. But should be more quiet, and have a larger coldplate (dont think it will have any effect in practicallity (only for TR4 or likewise). my Evga CLC 240 fits with standard width fans, but it is a tight fit. Debating on whether or not I should swap it for slim fans since the bend off of the radiator is pretty hard. 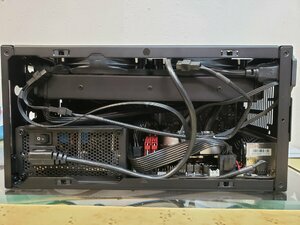 I mounted it the other way to avoid the bend and then routed the tubes toward the power supply. 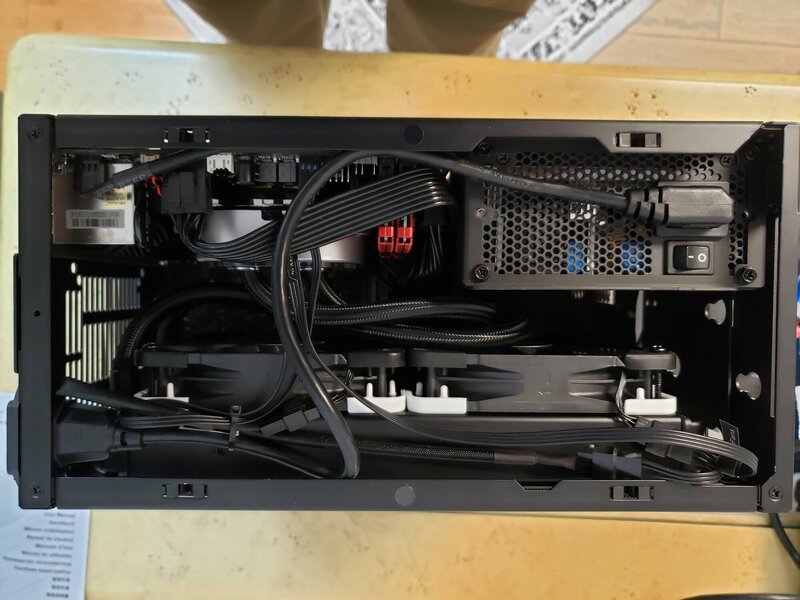 Why not just have the rad outwards to the sidepanel and the fans on the inside? (pull config). That would give more room for the tubes.. Is there anything negative about that way of mounting it? This foam could be good to prevent dust to enter the M1 when stopped. Any link to the product you have installed? Yeah this is much better. Wll post back once I have a chance to bench it.